Stuart Staniford directed me today to a report from the Georgetown University Center on Education and the Workforce about the distribution of earnings throughout the workforce (here). It’s got lots of interesting stuff, including basic data about the value of education. On average, workers with a college degree earn 74% more over their lifetimes than workers with only a high school diploma. And workers with a high school diploma earn 34% more than high school dropouts. But for some reason, the chart below drew my eye. 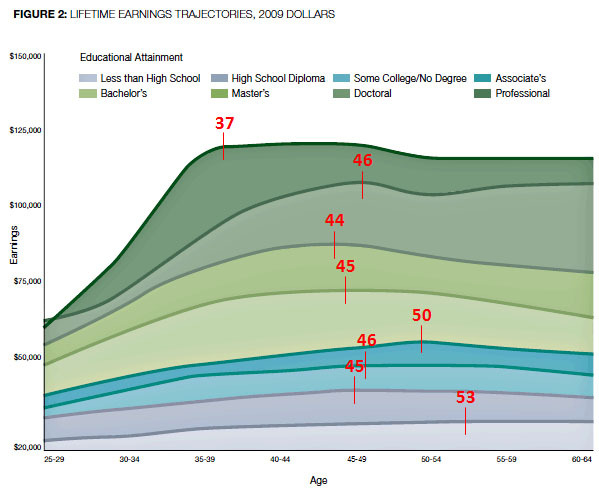 It shows the trajectory of earnings from age 25 through 65, and most people hit their peak earning power around age 45. But there are two big outliers at the very top and very bottom. The earnings of those with professional degrees rise very steeply and max out at age 37, after which they go nowhere. Conversely, although high school dropouts don’t make much, their earnings rise steadily for quite a long time, not peaking until about age 53. Also: people with Associate’s degrees have an oddly delayed peak until about age 50. This is, needless to say, one of the least important pieces of information in the report, but it seemed sort of interesting to me. Discussion?